Bill Frisell is amazing. He is one of those quirky musicians who has constructed his own world of sound, a slightly strange, slightly sentimental reflection of America. Jazz guitarist Jim Hall called him "the Thelonius Monk of the electric guitar" and the comparison is apt. Frisell's country rock jazz guitar sound and his beautifully simple compositions are utterly wedded to one another. 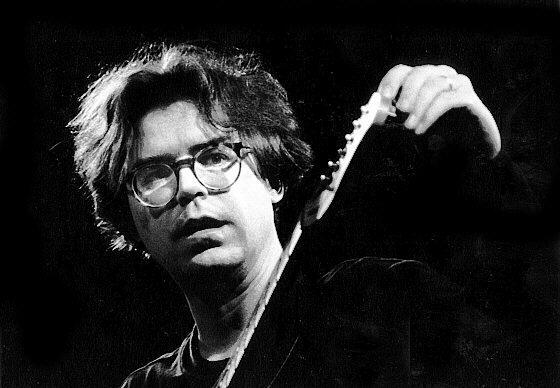 It is hard to imagine anyone but Bill Frisell playing these songs. His sound is utterly unique, the product of an individual musical mind Frisell's guitar playing is like the playful harmonies of Jim Hall informed by noisy effects of Jimi Hendrix. He revels in distorted noise, country twang and jazz licks with the same wide eyed exploration. Although his sound has shifted over the years, I would say it has always had the simplicity and exuberance of a child, and and lately his writing and playing has a sound that could only be described as simple nostalgia. Starting in the NYC downtown jazz scene of the 80's, playing with the likes of John Zorn and Tim Berne, Frisell developed a simple guitar sound even as he explored noise and rock improvisation. He still retains the exploratory spirit of the 1980's even as he moved to more melodic and tonal work. Frisell's musical world is a strange, wonderful, and exciting place, both accessible in sound and unorthodox in techniques and forms. You can also check out my Unofficial John Zorn Homepage with album information, commentary, and links. This site was created and maintained by me, Jamie Graves. Feel free to email me at james.graves@oberlin.edu with any questions you have about Frisell.